Brief Synopsis: The DC Universe is turned upside down when someone attacks a family member of a Justice Leaguer. 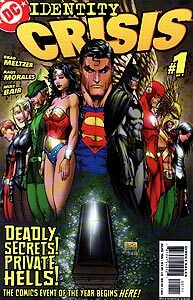 Issue Notes: Events in this story must take place following the events of JLA Classified issues 4-9 for reasons obvious to readers of this issue. As the story progresses, many changes were made to the history of the DC Universe as a result of revelations made in this series, though none directly effect the history of Booster Gold. Issue Reprints: This issue has been collected with the rest of the series in Identity Crisis. Though Booster is not shown on-panel, a narrative panel details that Booster and Beetle are leading a group of heroes to interrogate Heat Wave, a former member of Flash's Rogues Gallery recently turned hero. The only evidence incriminating Heat Wave is that Sue was badly burned, indicating a criminal who uses a fire motif. Boosterrific Review: The first-class art of Rags Morales and Michael Bair set the stage for writer Brad Meltzer's whodunit story about the murder of a beloved Justice League supporting character and the widespread emotional damage that it causes. 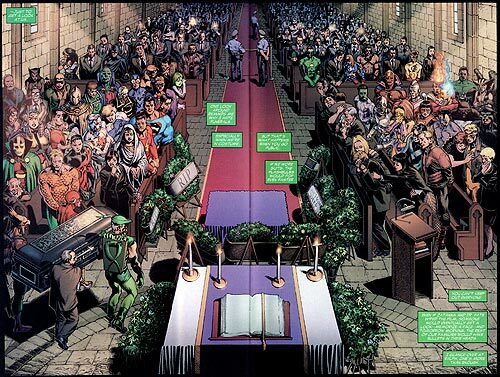 While we at Boosterrific believe that the storyline of the Identity Crisis mini-series is ultimately flawed and recklessly tragic for the DC Universe, that doesn't stop this first issue from being a remarkably beautiful and deep comic book that is successful on all fronts and is completely deserving of any praise that it receives.